The order Testudines includes both extant (living) and extinct species. The earliest known turtles date from 215 million years ago, making turtles one of the oldest reptile groups and a more ancient group than lizards, snakes and crocodiles. Of the many species alive today, some are highly endangered. Like other reptiles, turtles are ectotherms—their internal temperature varies according to the ambient environment, commonly called cold-blooded. However, leatherback sea turtles have noticeably higher body temperature than surrounding water because of their high metabolic rate. The largest living chelonian is the leatherback sea turtle (Dermochelys coriacea), which reaches a shell length of 200 centimetres (6.6 ft) and can reach a weight of over 900 kilograms (2,000 lb). Freshwater turtles are generally smaller, but with the largest species, the Asian softshell turtle Pelochelys cantorii, a few individuals have been reported up to 200 centimetres (6.6 ft). This dwarfs even the better-known alligator snapping turtle, the largest chelonian in North America, which attains a shell length of up to 80 centimetres (2.6 ft) and a weight of about 60 kilograms (130 lb). Giant tortoises of the genera Geochelone, Meiolania, and others were relatively widely distributed around the world into prehistoric times, and are known to have existed in North and South America, Australia, and Africa. They became extinct at the same time as the appearance of man, and it is assumed humans hunted them for food. The only surviving giant tortoises are on the Seychelles and Galápagos Islands, and can grow to over 130 centimetres (51 in) in length, and weigh about 300 kilograms (660 lb). The largest ever chelonian was Archelon ischyros, a Late Cretaceous sea turtle known to have been up to 4.6 metres (15 ft) long. The smallest turtle is the speckled padloper tortoise of South Africa. It measures no more than 8 centimetres (3.1 in) in length and weighs about 140 grams (4.9 oz). Two other species of small turtles are the American mud turtles and musk turtles that live in an area that ranges from Canada to South America. The shell length of many species in this group is less than 13 centimetres (5.1 in) in length. Most turtles that spend most of their lives on land have their eyes looking down at objects in front of them. Some aquatic turtles, such as snapping turtles and soft-shelled turtles, have eyes closer to the top of the head. These species of turtles can hide from predators in shallow water, where they lie entirely submerged except for their eyes and nostrils. Sea turtles possess glands near their eyes that produce salty tears that rid their body of excess salt taken in from the water they drink. The upper shell of the turtle is called the carapace. The lower shell that encases the belly is called the plastron. The carapace and plastron are joined together on the turtle's sides by bony structures called bridges. The inner layer of a turtle's shell is made up of about 60 bones that include portions of the backbone and the ribs, meaning the turtle cannot crawl out of its shell. In most turtles, the outer layer of the shell is covered by horny scales called scutes that are part of its outer skin, or epidermis. Scutes are made up of a fibrous protein called keratin that also makes up the scales of other reptiles. These scutes overlap the seams between the shell bones and add strength to the shell. Some turtles do not have horny scutes. For example, the leatherback sea turtle and the soft-shelled turtles have shells covered with leathery skin instead. The rigid shell means turtles cannot breathe as other reptiles do, by changing the volume of their chest cavity via expansion and contraction of the ribs. Instead, turtles breathe in two ways. First, they employ buccal pumping, pulling air into their mouth, then pushing it into the lungs via oscillations of the floor of the throat. Secondly, by contracting the abdominal muscles that cover the posterior opening of the shell, the internal volume of the shell increases, drawing air into the lungs, allowing these muscles to function in much the same way as the mammalian diaphragm. The shape of the shell gives helpful clues to how a turtle lives. Most tortoises have a large, dome-shaped shell that makes it difficult for predators to crush the shell between their jaws. One of the few exceptions is the African pancake tortoise, which has a flat, flexible shell that allows it to hide in rock crevices. Most aquatic turtles have flat, streamlined shells which aid in swimming and diving. American snapping turtles and musk turtles have small, cross-shaped plastrons that give them more efficient leg movement for walking along the bottom of ponds and streams. The color of a turtle's shell may vary. Shells are commonly colored brown, black, or olive green. In some species, shells may have red, orange, yellow, or grey markings and these markings are often spots, lines, or irregular blotches. One of the most colorful turtles is the eastern painted turtle which includes a yellow plastron and a black or olive shell with red markings around the rim. As mentioned above, the outer layer of the shell is part of the skin; each scute (or plate) on the shell corresponds to a single modified scale. The remainder of the skin is composed of skin with much smaller scales, similar to the skin of other reptiles. Turtles do not molt their skins all at once, as snakes do, but continuously, in small pieces. When kept in aquaria, small sheets of dead skin can be seen in the water (often appearing to be a thin piece of plastic) having been sloughed off when the animal deliberately rubs itself against a piece of wood or stone. Tortoises also shed skin, but a lot of dead skin is allowed to accumulate into thick knobs and plates that provide protection to parts of the body outside the shell. The amphibious turtles normally have limbs similar to those of tortoises, except the feet are webbed and often have long claws. These turtles swim using all four feet in a way similar to the dog paddle, with the feet on the left and right side of the body alternately providing thrust. Large turtles tend to swim less than smaller ones, and the very big species, such as alligator snapping turtles, hardly swim at all, preferring to simply walk along the bottom of the river or lake. As well as webbed feet, turtles have very long claws, used to help them clamber onto riverbanks and floating logs, upon which they like to bask. Male turtles tend to have particularly long claws, and these appear to be used to stimulate the female while mating. While most turtles have webbed feet, some, such as the pig-nosed turtle, have true flippers, with the digits being fused into paddles and the claws being relatively small. These species swim in the same way as sea turtles (see below). Sea turtles are almost entirely aquatic and have flippers instead of feet. Sea turtles fly through the water, using the up-and-down motion of the front flippers to generate thrust; the back feet are not used for propulsion, but may be used as rudders for steering. Compared with freshwater turtles, sea turtles have very limited mobility on land, and apart from the dash from the nest to the sea as hatchlings, male sea turtles normally never leave the sea. Females must come back onto land to lay eggs. They move very slowly and laboriously, dragging themselves forwards with their flippers. 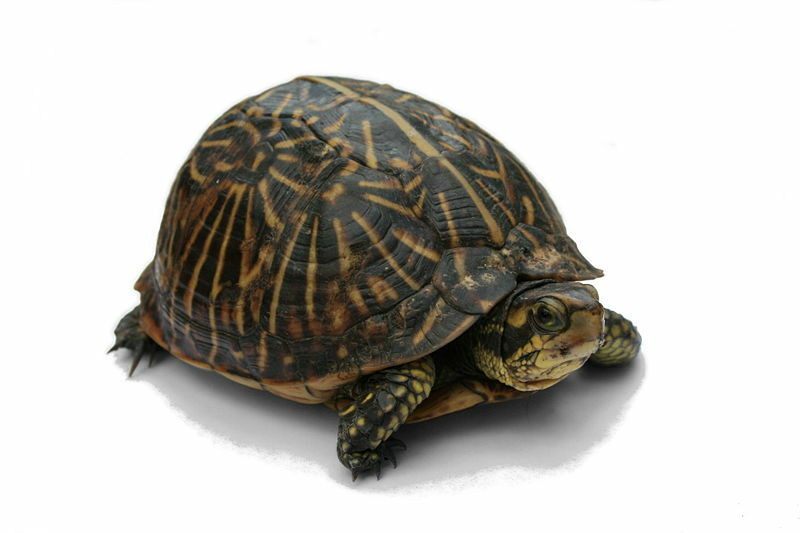 Although many turtles spend large amounts of their lives underwater, all turtles and tortoises breathe air, and must surface at regular intervals to refill their lungs. They can also spend much of their lives on dry land. Aquatic respiration in Australian freshwater turtles is currently being studied. Some species have large cloacal cavities that are lined with many finger-like projections. These projections, called papillae, have a rich blood supply, and increase the surface area of the cloaca. The turtles can take up dissolved oxygen from the water using these papillae, in much the same way that fish use gills to respire. Turtles lay eggs, like other reptiles, which are slightly soft and leathery. The eggs of the largest species are spherical, while the eggs of the rest are elongated. Their albumen is white and contains a different protein from bird eggs, such that it will not coagulate when cooked. Turtle eggs prepared to eat consist mainly of yolk. In some species, temperature determines whether an egg develops into a male or a female: a higher temperature causes a female, a lower temperature causes a male. Large numbers of eggs are deposited in holes dug into mud or sand. They are then covered and left to incubate by themselves. When the turtles hatch, they squirm their way to the surface and head toward the water. There are no known species in which the mother cares for the young. Sea turtles lay their eggs on dry, sandy beaches. Immature sea turtles are not cared for by the adults. Turtles can take many years to reach breeding age, and in many cases breed every few years rather than annually. Turtles, particularly small terrestrial and freshwater turtles, are commonly kept as pets. Among the most popular are Russian tortoises, spur-thighed tortoises, and red-eared sliders. In the United States, due to the ease of contracting salmonellosis through casual contact with turtles, the U.S. Food and Drug Administration (FDA) established a regulation in 1975 to discontinue the sale of turtles under 4 inches. It is illegal in every state in the U.S. for anyone to sell any turtles under 4 inches (10 cm) long. Many stores and flea markets still sell small turtles due to a loophole in the FDA regulation which allows turtles under 4 inches to be sold for educational purposes. Some states have other laws and regulations regarding possession of red-eared sliders as pets because they are looked upon as invasive species or pests where they are not native, but have been introduced through the pet trade. As of July 1, 2007, it is illegal in Florida to sell any wild type red-eared slider. Unusual color varieties such as albino and pastel red-eared sliders, which are derived from captive breeding, are still allowed for sale.